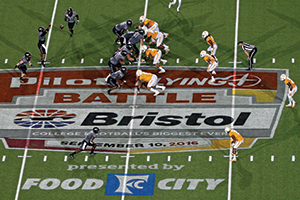 The long-awaited Battle at Bristol took place Sept. 10 at Bristol Motor Speedway. The converted racetrack attracted 156,990 fans to a game between the University of Tennessee and Virginia Tech. According to the Guinness Book of World Records, the game — won by Tennessee, 45-24 — broke an attendance record previously set by a 2013 contest between the University of Michigan and Notre Dame in Ann Arbor, Mich. The magazine looked at Bristol’s preparations for the game in an April community profile.